Less is more.The folks at S.W. Basics subscribe to the mantra that using fewer ingredients means more potent skincare. 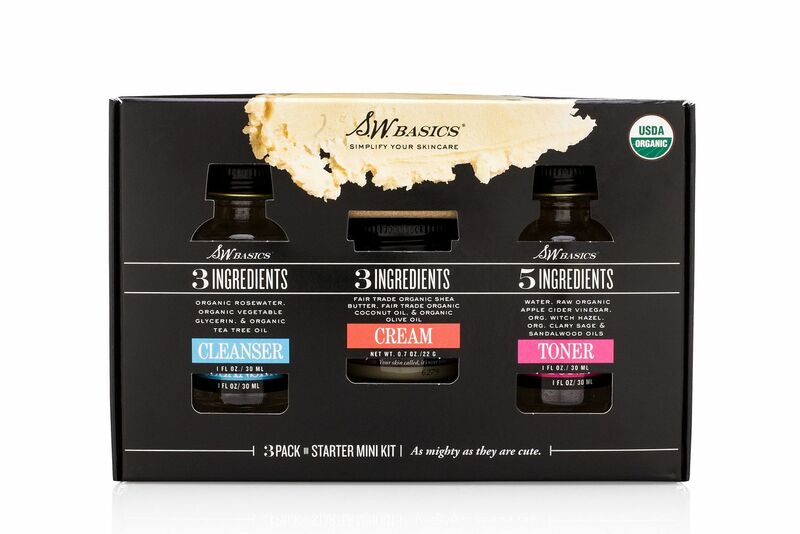 And their Starter Mini Kit is the perfect example, with each cute little glass bottle containing 5 or less, certified organic ingredients. Let’s start with the Cleanser, which only has 3 ingredients. Not to worry though, because those 3 ingredients will do the trick in cleaning your face of all the dirt and grime that your TrailblazerGirl activities can muster. It has a wonderful rose scent thanks to the rosewater, and the vegetable glycerin ensures that your skin won’t get dried out, while the tea tree oil is a natural antibacterial, anti-inflammatory agent that’s also effective at relieving acne. Next, apply the Toner at night, which has 5 ingredients: water, raw apple cider vinegar, witch hazel, and clary sage and sandalwood essential oils. It has a bit of a pungent smell because of the apple cider vinegar, but that’s what makes it so effective at balancing your skin’s oil production. Finally, treat your skin to the 3-ingredient Cream (shea butter, coconut oil, and olive oil) that is luxuriously nourishing. We agree with the less is more philosophy, especially with the Starter Mini Kit, a great introduction to the S.W. Basics line of minimalist skincare products!